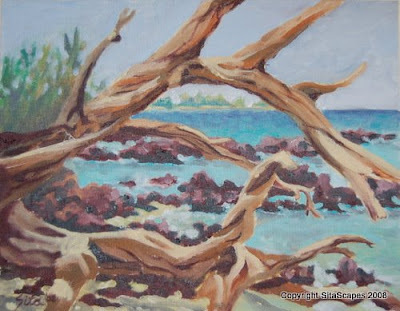 Artists Comments: For anyone who has visited Wailea or more commonly, Beach 69, the large driftwood tree is striking and memorable. Limbs bleached from constant sun and ocean spray highlights are accentuated making it easier for me to focus on the brightest areas of the subject. To achieve the sharp "smile lines" of the twisted tree trunk I called on my trusty super-thin magic brush which seems to take on a dance of its own! I love it!